One local product and one local restaurant: those were the subjects of this week's postings. 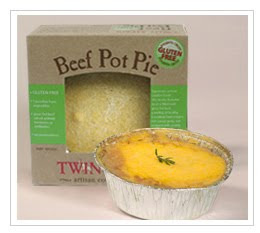 On Monday, I wrote about the gluten-free beef pot pie made by Twin Hens of Princeton, New Jersey, while on Wednesday, I reviewed Iron Hill Brewery & Restaurant, with eight locations throughout Pennsylvania, New Jersey and Delaware. Thanks to reader Tami for alerting me about two Absecon, New Jersey restaurants that offer gluten-free options: China Sea of Absecon has a separate menu (the link is at the Gluten Free Philly restaurant page) and Calabria Pizza Italian Grill offers 10-inch personal gluten-free pizzas. In addition to serving food that can be prepared gluten free, Kildare's Pub serves Redbridge beer and Strongbow cider. The restaurant has area locations in King of Prussia, Philadelphia and West Chester, Pennsylvania and in Newark, Delaware. Joe's Crab Shack, with local outposts in Lawrenceville, New Jersey and Wilmington, Delaware, has a gluten-free menu available. Included are the restaurant's seafood Steampots, crabs, mahi-mahi, tilapia, steak and grilled shrimp, Key West Chicken (no sauce), salmon (no glaze), Bucket of Shrimp and Cobb Salad (no dressing). Olive Garden has updated its gluten-free menu: gone is the pork medallions entree but there's now a gluten-free penne dish with marinara sauce. The Mixed Grill entrees on the menu should be prepared without demi-glace, which is not gluten free. On a related note, the chain is planning to open a location in Collegeville, Pennsylvania in November 2009. Diners can now make online reservations for all Delaware Valley P.F. Chang's China Bistro locations. I updated the site's gluten-free-friendly markets list to include two future Whole Foods Market locations: one in Plymouth Meeting, Pennsylvania (tentatively set to open in November 2009) and one on Concord Pike in Wilmington, Delaware (in development). Back in April, I wrote about a new line of frozen gluten-free meals from Gluten Free Café. The manufacturer, Hain Celestial, has just rolled out snack bars under that nameplate. New are chocolate, lemon and cinnamon sesame bars made with flax seed. They're available online at Amazon.com. 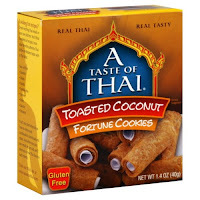 A Taste of Thai has introduced Toasted Coconut Fortune Cookies that are gluten free. The cookies can be ordered online direct from the manufacturer. Kinnikinnick Foods just announced the newest version of their gluten-free KinniTOOS sandwich creme cookies: chocolate cookies with a fudge creme filling. The company says the cookies will be in stores come November, but they are available for home delivery by ordering through its website. Wow Baking Company is offering visitors to their website a free gluten-free cookie of their choice. My older son recently tried their Snickerdoodle cookie and thought it tasted great. (Wow Baking's cookies and cake mixes are available at Amazon.com.) Thanks to Maureen at Hold The Gluten for the tip. When my older son was younger, it was always a challenge at the start of the school year to educate faculty and administrators about his diet. Several years ago my wife prepared a two-page handout that we gave to his teachers, and we've used it every year since. The letter serves as a primer on the diet and gives them guidance about lunch time and snack time preparation, when a classmate's birthday will be celebrated and when certain arts and crafts materials are used. Just drop me a line at gfphilly[at]gmail[dot]com if you are interested in getting a copy of the note and I'll email it out to you. To break up the travel involved in getting our older son to Camp Celiac in Rhode Island two weekends ago, we planned a Saturday night stay in Boston, about an hour away from the camp. We rode north in an Amtrak Northeast Regional train from Philadelphia early Saturday morning. I didn't expect much of a crowd at that time of day, but the train was packed. Once we settled into our seats - with our luggage in three different places - I took out my firm-issued laptop to set the boys up with a DVD movie. (Note to self: buy a cheap DVD player next time.) First, the laptop wouldn't start up. After I finally got in touch with one of the firm's IT guys, the laptop booted through to the desktop. When I went to put on a DVD, the software couldn't run the movie. IT guy tells me that I have to download a different player. Um, problem - I can't connect to the Internet because my BlackBerry isn't set up to work as a modem. IT guy (thanks, Chris!) gets me hooked up with Verizon to connect, I'm able to download the proper program, and the DVD starts playing. Crisis averted. I'm already exhausted, and we're only one hour into the ride. To get out of the house early, we decided to forgo breakfast at home and instead eat on the train. I knew from experience that the train's Cafe Car had a microwave, so we brought an Ian's waffle, egg and cheese breakfast sandwich with us and planned to ask the attendant to heat it up for my older son. As it turns out, Amtrak frowns upon warming up waffle, egg and cheese breakfast sandwiches. I explained my son's diet situation to the attendant (and tipped him for good measure), and he told me he would do it "this one time." Another crisis averted. Taking the train turned out to be a great idea, though, since we were able to get up as we pleased. The four of us found a table in the Cafe Car, where we ate and played Travel Scrabble. We arrived at Back Bay Station about 2 p.m, tired and hungry, when we taxied over to our hotel, the Sheraton near the Prudential Center. 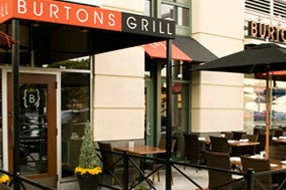 After checking in and getting our bags up to the room, we headed back down and took a 10-minute cab ride over to Burton's Grill, just two blocks from Fenway Park. The Boston location is one of three in Massachusetts, with other outposts in Connecticut and Virginia. All locations offer a gluten-free menu. Our older son enjoyed a cheeseburger served on a gluten-free bun with skin-on french fries. We relaxed the rest of the afternoon by taking a trolley tour of the city (twice! 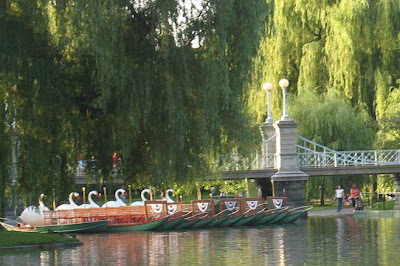 ), where we saw Paul Revere's house, Boston Public Garden (pictured, above), the U.S.S. Constitution, and parts of the Freedom Trail before returning to our hotel. In researching Boston restaurants in advance of the trip, I found an Italian restaurant called Nebo that had gluten-free pizza and pasta. While I wanted to check it out for dinner, it wasn't particularly close to the hotel and we all were beat from a long day. So we ended up walking over to Legal Sea Foods at the Prudential Center. It had been a while since we've been to the King of Prussia location, so we were pleasantly surprised to find our server bringing out gluten-free rolls along with the wheat-flour bread at the start of the meal. Each of us ordered the grilled shrimp, which came with a couple of sides. In Boston proper, there are several other chain restaurants that have gluten-free menus, including Uno Chicago Grill and P.F. Chang's. Eateries local to the area that offer gluten-free options include Elephant Walk (Cambodian/French), Wagamama (Asian), Myers + Chang (Asian), Papa Razzi (Italian) and Marco (Italian). My wife and I were so nervous about dropping off our son at camp the next day, we hardly slept (although he didn't seem to be worried at all.) The next morning we ordered from the breakfast buffet in the hotel restaurant, where the chef prepared a separate order of eggs, bacon and fruit for our older son. We took advantage of the beautiful Sunday morning weather and walked over to Fenway Park in time for a 10 a.m. tour. Fenway, like Wrigley Field and the old Yankee Stadium, has so much history attached to it that it's hard not to be impressed even if you're not a fan of the home team. 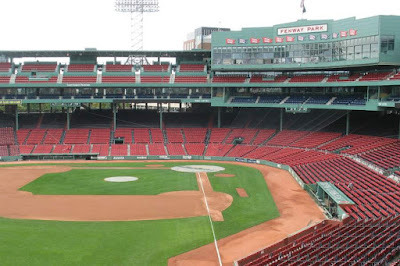 As part of the tour, we sat in the seats atop the famed Green Monster, in the wooden Grandstand seats (circa 1934) down the left-field line, and in the press box. Incidentally, across the street from Fenway on Yawkey Way is the largest team store I have ever seen. It very well may be the capital of Red Sox Nation. We took the "T" back to the hotel, where we picked up a rental car and loaded up the luggage for the short trip to camp. I had brought my portable GPS along, and was able to locate a Ninety Nine Restaurant near the Massachusetts-Rhode Island border for lunch. While it was emotional for me and my wife to unload our son's bags at camp and unpack his belongings, we were comforted by the fact that he would be surrounded by kids just like him for nearly a week. 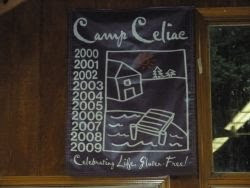 Many parents we spoke to while waiting in line to sign in told us that their children had been to Camp Celiac before and that it was the highlight of their summers. We felt confident that our son would feel the same way. 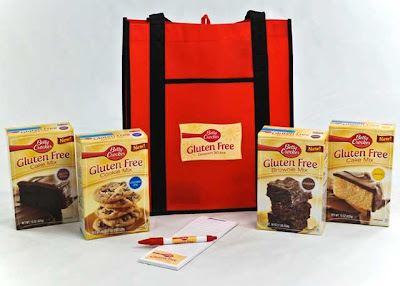 You still have time to enter Gluten Free Philly's most popular giveaway yet - a "Sweet Treats" prize pack from Betty Crocker featuring all four varieties of the company's gluten-free dessert mixes. The giveaway runs until Sunday night. For more details and to enter, check out Monday's post. On Wednesday, I wrote about the gluten-free and gluten-free/sugar-free pizzelle made by Dee Tees'. The cookies can be found in many stores and markets in the Delaware Valley. On the restaurant front, Grandma's Grotto in Horsham, Pennsylvania now serves gluten-free pizza from Still Riding Pizza, along with no-gluten pasta. (Thanks to a reader for the tip.) The eatery also offers gluten-free lasagna, baked ziti and meatballs, and will soon be installing a separate fryer for french fries. Reader Tom commented that Jasper, a French-influenced BYOB in Downingtown, Pennsylvania is gluten-free friendly. 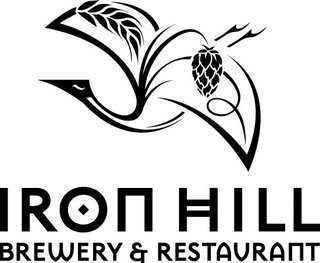 Iron Hill Brewery, with locations in Media, North Wales, Phoenixville and West Chester, Pennsylvania, Maple Shade, New Jersey, and Newark and Wilmington, Delaware, has posted its gluten-free menu online. Although there's no gluten-free beer brewed on the premises, the restaurants do serve Redbridge by the bottle. Pei Wei Asian Diner now has online ordering at its four Delaware Valley locations (Philadelphia/Main Line and Springfield, Pennsylvania; Cherry Hill and Moorestown, New Jersey). First-time users get 25 percent off of their entire order. Grub Street reports that Gayle, in Philadelphia's Queen Village neighborhood, will be closing on September 4 after five years. The Reading, Pennsylvania R.O.C.K. chapter is holding its back-to-school event tomorrow - Saturday, August 15 - at the West Lawn United Methodist Church in West Lawn, Pennsylvania from 2 p.m. to 4 p.m. There will be a discussion on digestive health and naturally gluten-free foods from a local farm available for purchase. The Mercer County, New Jersey celiac support group is set to meet at DeLiteful Foods in Lawrenceville on August 26 at 7 p.m. Attendees are asked to bring along their favorite gluten-free foods to share. Send an email to mercerceliacsupport[at]gmail[dot]com for more information. That's it for this week. Stay cool this weekend! For more than a decade, Debbie Garlotta has been baking authentic Italian pizzelle. A few years ago, one of her customers asked if she could make a gluten-free version of her handmade cookies. So she experimented with different ingredients until she was satisfied with the result. 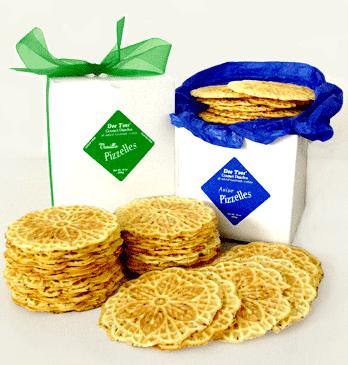 Now, her Southampton, New Jersey-based company, Dee Tees' Gourmet Italian Pizzelles, offers gluten-free and gluten-free/sugar-free pizzelle in three varieties year-round: vanilla, chocolate chip and anise. A fourth gluten-free flavor - pumpkin - is sold during fall months. Debbie told me that she has separate baking schedules for the pizzelle made with wheat and her gluten-free versions, which use rice flour. She says that her equipment and facility are cleaned after every run of the cookies with gluten and she waits several days from the end of each run before starting a two-week gluten-free production. The gluten-free and award-winning gluten-free/sugar-free pizzelle are sold in packs of 13-14 cookies each and are available at stores throughout the area. There's a store-locator feature on the company's website, but not all stores carry the gluten-free varieties. Debbie mentioned that in Pennsylvania, Martindale's Natural Market in Springfield and Altomonte's Italian Market in Doylestown and Warminster stock the gluten-free cookies, as do Springdale Farms in Cherry Hill, New Jersey, Mr. Ritt's Bakery in Millville, New Jersey and the Zallie's ShopRite markets in southern New Jersey. You can call Dee Tees' directly at (609) 859-9159 to find out which stores near you sell them. Depending on the store, a package of pizzelle sells for around $5.99-$6.99. Since my last News & Notes post two weeks ago, I wrote about some new products and one of my family's favorite restaurants. For those of you in the Delaware Valley that haven't already paid a visit to Pasta Pomodoro in Voorhees, New Jersey, you will be suitably impressed with the breadth of the restaurant's gluten-free menu. Last Friday, I wrote about Bella Monica gluten-free flatbread pizzas, which are now widely available at natural foods stores in the Philadelphia area. Since I posted my review, the company wrote on its Twitter page that the pizzas should be in Wegmans markets this fall and that it's also working on a personal-size pizza. Froose, a healthy alternative to kids' ordinary sugary juices, was the subject of my post on Wednesday. The drink comes in three fruit flavors and uses organic brown rice syrup, rather than high-fructose corn syrup or evaporated cane juice, as its sweetener. Last month, I wrote about the gluten-free restaurant options available near the Philadelphia Eagles' training camp in Pennsylvania's Lehigh Valley. I updated the post this week to note that Boston's The Gourmet Pizza, with a location in Allentown, recently added gluten-free pizza to its menu. 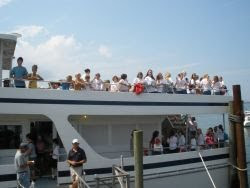 The GREAT food-service training program, sponsored by the National Foundation for Celiac Awareness, has announced that Steve & Cookie's By the Bay, an upscale American restaurant in Margate, New Jersey, has completed the course and that the kitchen and staff are knowledgeable about preparing and serving gluten-free menu options. I've added the establishment to my restaurant list. New to the bakery list this week are two shops. Christine's Italian Pastry Shoppe in Northfield, New Jersey (which has an owner with celiac disease) sells gluten-free hot dog and hamburger buns, rolls, cakes and cupcakes. Reader Leslie wrote me to advise that the Swiss Haus Bakery in Center City Philadelphia now offers gluten-free peanut butter bars, banana loaves and brownies. During a visit this week, an employee there told me that the gluten-free baked goods are made in a separate area of the kitchen using equipment and utensils that are thoroughly cleaned before use. I also stopped by the new Center City Philadelphia outpost of Max Brenner, Chocolate by the Bald Man to inquire about whether any of the company's chocolates are gluten free. Sadly, an employee told me that some of the chocolates contain gluten ingredients and, because the sweets are not made in the store, she couldn't say whether any steps to prevent cross-contamination are taken. Several readers have asked me whether the upcoming Appetite for Awareness event on September 30 is child-friendly. 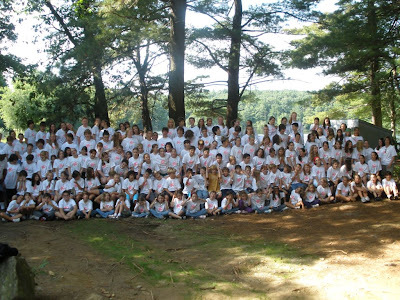 There were some children in attendance last year, and I would say that kids ages 5 and up would be fine there. I wouldn't recommend bringing stroller-age children, though, since a large crowd is expected and there's not a lot of room to push around a stroller. Lastly, I wanted to mention that you can support the Gluten Free Philly blog by shopping at Amazon.com - getting there through the links on this site - even if you aren't buying gluten-free foods, cookbooks and the like (it doesn't cost you anything extra and I get a small referral fee). This month, Amazon is offering lots of discounts on gluten-free groceries - all offers are valid through August 30, 2009. Orders over $25 are always shipped free via standard shipping, but for a limited time, there's $.99 standard shipping on all grocery products fulfilled by Amazon.com for orders less than $25. This service normally costs $4.59 plus $.59 per item. First, you can save 20 percent on Conte's gluten-free pasta and pizza when you spend $59 or more on those products. Use promotional code CONTE809 at checkout. Also, the company is offering free expedited shipping (be sure to upgrade at checkout). You can also save up to 35 percent on EnviroKids gluten-free cereals, vanilla animal crackers and crispy rice bars: save 20 percent when you enter code NATPAT67 at checkout. Plus, save an additional 15 percent when you combine the instant rebate with your Subscribe & Save order. Save 25 percent when you buy any eligible Arico gluten-free cookies and chips. Use the following promotional code when you check out: ARICOFDS. Also, you can save 50 percent on Lucy's gluten-free cookies with promotional code DOCTOR55. Philadelphia-area parents and their school-age children soon will be preparing for another school year. Because many local districts don’t offer gluten-free options in their schools’ cafeterias, parents of children with celiac disease often have to pack lunches, drinks and snacks for their kids every day. A healthier alternative to boxed juices, many of which contain high-fructose corn syrup sweeteners, is Froose, a gluten-free drink made with organic whole-grain rice and fruit. A 4.2-fluid-ounce box of Froose contains 80 calories and 3 grams of fiber. The product is sold in packages of four boxes at local Acme Markets, Whole Foods Markets and through the Froose website. Froose will soon be debuting another product: vegan gummy bears made with gluten-free whole grains. These soft chews also will contain 3 grams of fiber per serving and will be sweetened with organic brown rice syrup. They’re expected to be on store shelves this fall.